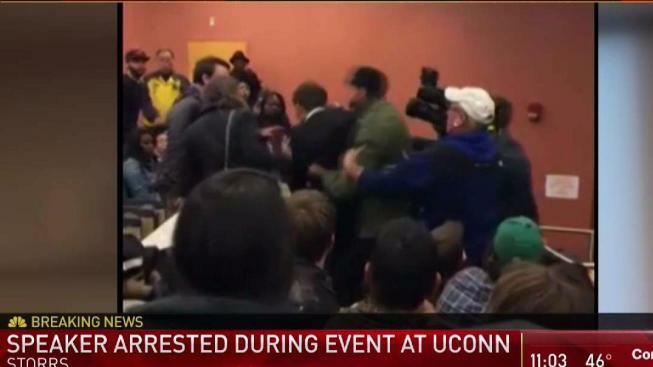 A conservative commentator giving a speech at the University of Connecticut was arrested Tuesday after a fight broke out at a speech titled, "It's OK To Be White." UConn's College Republicans student group was sponsoring the appearance Tuesday evening by conservative commentator Lucian Wintrich. Wintrich is the White House correspondent for the right-wing blog Gateway Pundit, which said the talk would be about "identity politics" in today's cultural and political landscape. The event was controversial from the start and students who spoke to NBC Connecticut said they believed he should never have been allowed to speak on campus. UConn has said it supports free speech and does not bar speakers on the basis of content. The College Republicans said flyers advertising the event were torn down or defaced across campus. The speech itself, hosted at Schenker Hall, was constantly interrupted by heated debate. In a live video feed of the event posted to the UConn College Republicans Facebook page, a woman appears to take something from the podium. Wintrich goes after the woman, grabbing her as she tried to walk away, at which point security and several others rush into the fray. Warning: The video below was a raw, unedited live feed and contains some inappropriate language. Darden Livesay, a UConn junior, described what he saw. “There was a girl who came– she took the papers and I believe a microphone and she started walking up the stairs. And then Lucian went after her and then tried to put his arms around her and then from there it was just chaos," Livesay said. "Security came and jumped on him, one of the guys from his entourage came and was trying to get security off of him and then tried to get security off him, and they pinned them against the wall and they took him into the back room." Police quickly stepped in and led Wintrich away. He was charged with breach of peace and later released. Wintrich took to Twitter early Wednesday to blame UConn students for being "violent and disruptive." "It's really unfortunate that some of the kids at @UConn felt the need to be violent and disruptive during a speech that focused on how the leftist media is turning Americans against each other," he wrote. "Tonight proved my point." A crowd of between 100 and 150 people gathered outside the building after the event and police had to disperse the crowd. During the chaos someone broke a window and threw a smoke grenade, Reitz said. A UConn student, identified as 19-year-old Sean Miller, was arrested on accusations he broke the window. Reports that tear gas was dispersed are untrue, according to Reitz. No injuries have been reported. The whole incident remains under investigation.